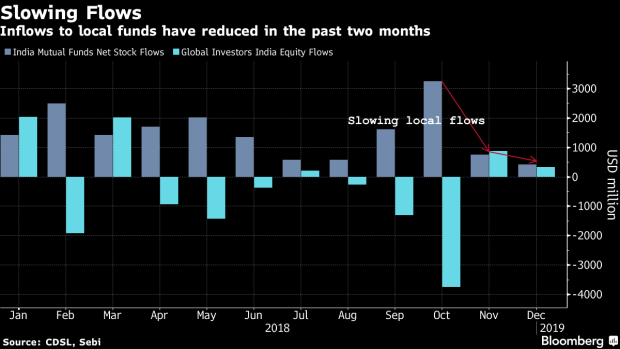 (Bloomberg) -- Indian equities rose a second day, ignoring a weak opening in Asian counterparts, as investors assessed local companies’ earnings. Two of the top four companies that have reported so far have beat estimates. The benchmark S&P BSE Sensex gained 0.2 percent to 36,379.58 as of 10:20 a.m. in Mumbai, extending gains for a second day. The NSE Nifty 50 Index also added 0.2 percent. A national election, along with a shrinking pool of cash as central banks across the world trim balance sheets, suggests 2019 will be challenging for Indian equities. Local flows are also showing signs of fatigue as stock funds received the smallest inflows in 23 months through December. Some analysts expect Indian equity gauges to remain in the doldrums until the poll results become clear, around May. Better-than-expected earnings growth will cushion the market, while challenges will arise with any weakening of the rupee against the dollar or a rebound of crude oil prices. Advises investors to pick shares of companies with low debt, wider profit margins and highest return ratios. Eighteen of the 19 sector indexes compiled by BSE Ltd. advanced, paced by a gauge of utilities. Zee Entertainment Enterprises Ltd. gained as much as 4.2 percent, among the top gainers on Nifty. Indo Rama Synthetics India Ltd. climbed 4.9 percent to its highest since February 2018, after a unit of Indorama Ventures said said it plans to buy a stake. Speciality Restaurants Ltd. surged by its daily limit, a record, after its October to December sales jumped 24 percent from a year earlier and its net income rose nearly 13 times. Of the four Nifty 50 companies that have reported earnings so far, two have topped analyst estimates and two have trailed, according to data compiled by Bloomberg.